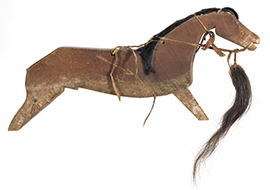 Honoring the Horse | A Song for the Horse Nation - October 29, 2011 through January 7, 2013 - The National Museum of the American Indian - Washington, D.C.
A warrior and his horse depended upon each other. 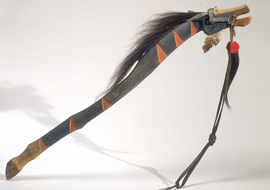 He would often immortalize a horse that had saved his life by carving an image of the horse, in the form of a stick that he would carry in ceremonial dances. 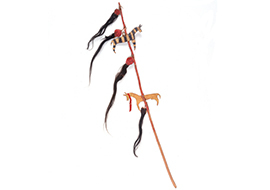 The horse sticks shown here show a special liveliness and personality. They are portraits of specific, well-loved animals. The famous warrior and diplomat Medicine Bear carved this likeness in memory of his war pony, killed in battle in northern Montana in the mid-1800s. The mane and tail on this dance stick came from that pony. No Two Horns fought at the Battle of the Little Bighorn in 1876. 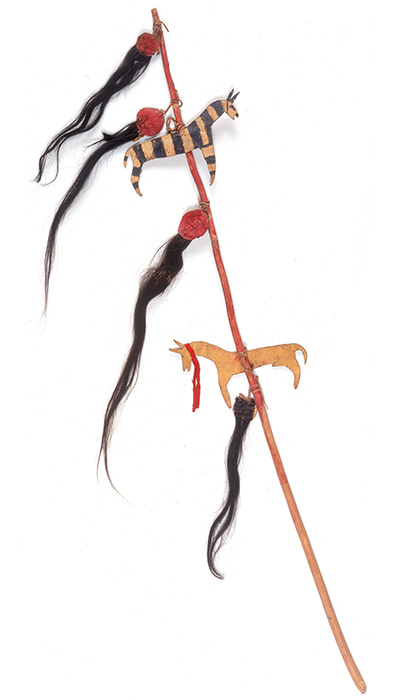 His famous (and widely copied) dance stick portrays a horse that died in that battle. The red triangles indicate wounds, and the scalp replica, dangling from the bridle, testifies to exploits in warfare. Although suffering from six separate wounds, the horse carried No Two Horns to victory. A Plains warrior earned the highest honor by “counting coup,” that is, galloping up to an enemy and touching him, sometimes with a special stick, instead of killing him. 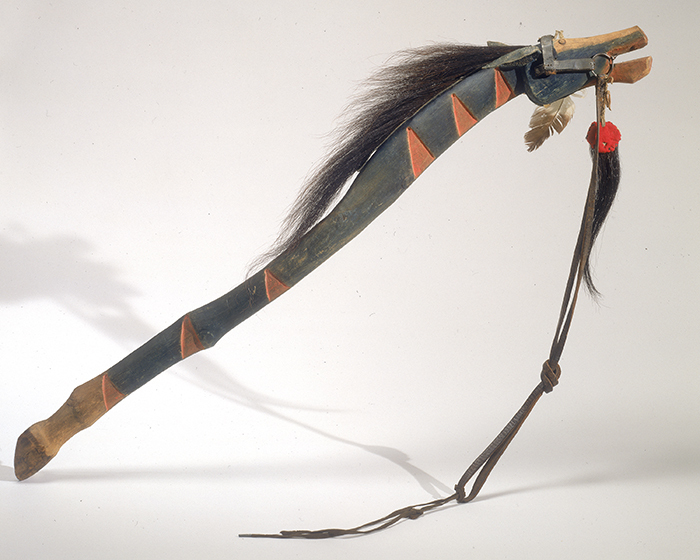 The rawhide horses attached to this coup stick represent the horses its owner rode in battle. The locks of hair are scalp replicas, made from horsehair attached to cloth or rawhide. A warrior would have carried this stick to honor a horse in ceremonial dances. Decorated with brass hawk bells, golden-eagle feathers, and imitation scalps, it depicts a cherished horse—possibly a pinto—that suffered two bullet wounds to the neck. 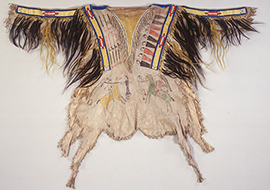 Tsitsistas/So´taeo´o (Cheyenne) shirt, ca. 1865. Montana. 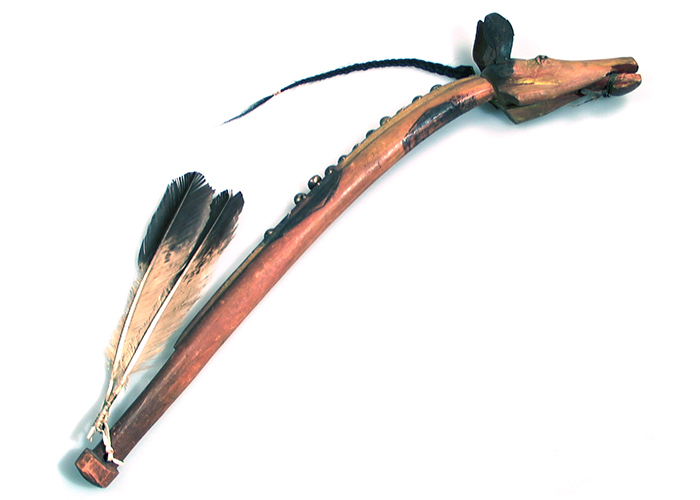 Porcupine quills, pony beads, hair locks, horsehair, pigment, hide, and sinew. 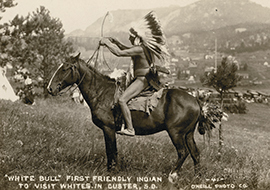 Photograph by Katherine Fogden, NMAI. 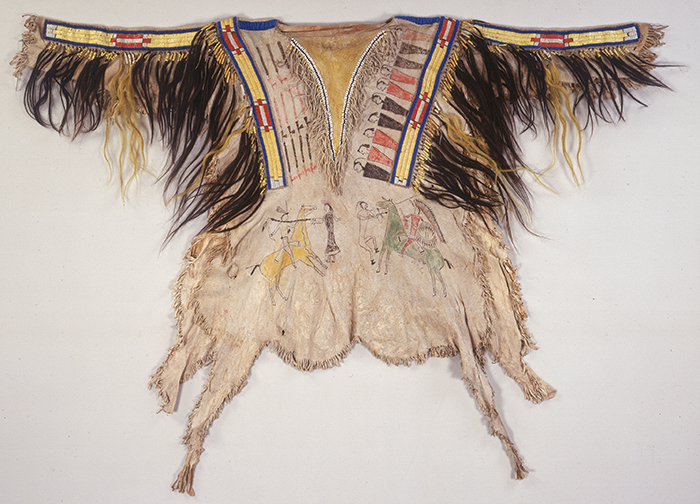 (8/8034)vEsteemed Plains warriors, spiritual leaders, and diplomats wore shirts such as this. Pipe images indicate the number of war parties that this man led. Human figures on the right represent defeated enemies; they are depicted without legs, for they will never move again. 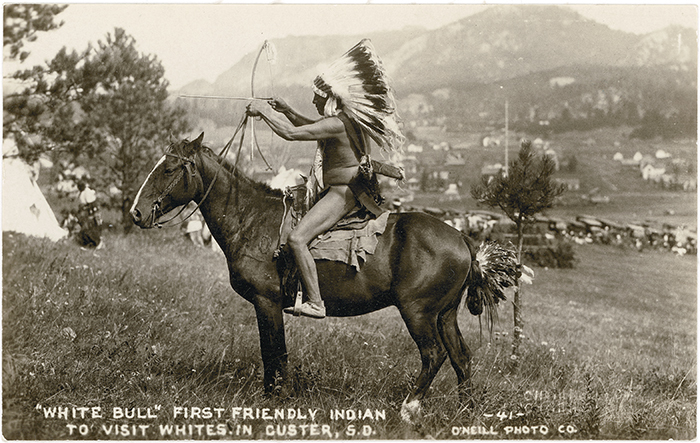 Possibly Chief Joseph White Bull (Mnicoujou Lakota), who has sometimes been credited with slaying Lieutenant Colonel George Armstrong Custer at Little Bighorn, Montana, on June 25, 1876.